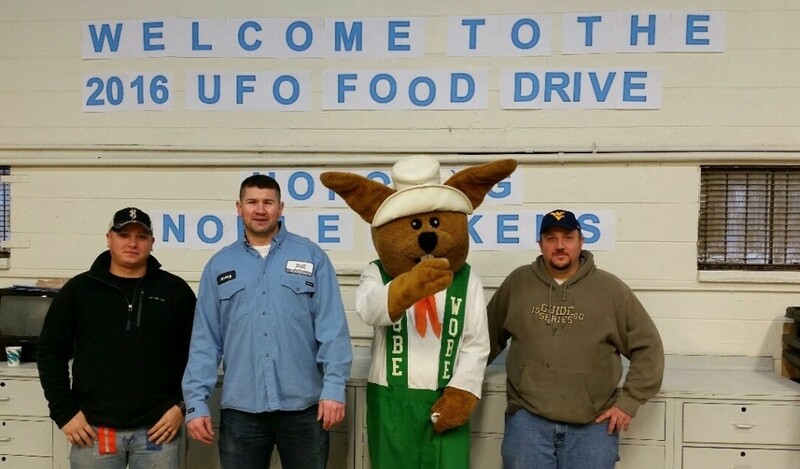 Open house held, donations received | United Food Operation, Inc.
Community members got a first look at the new headquarters of United Food Operation (UFO) Saturday during an open house in Institute. The Open House included a formal program to recognize major contributors and volunteers. 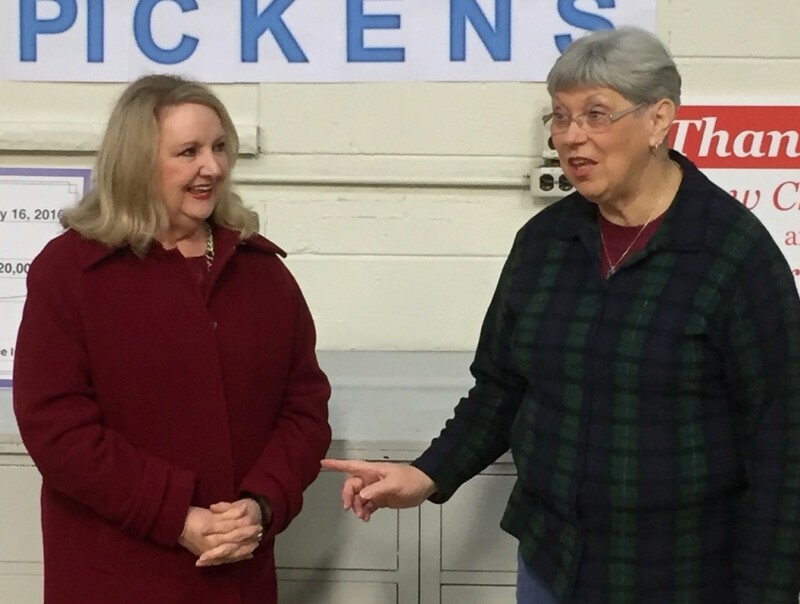 UFO Chairperson Elaine Harris expressed the groups gratitude to Dow Chemical and Bayer CropScience for their generous donations, which led to UFO basically being given the newly renovated building through a very favorable lease. Surveying the completely remodeled facility, Harris remembered times in years gone by when UFO had to work out of less than optimum space. “This is a wonderful space—UFO hasn’t always had it so good,” she said, recalling years when they had to move pallets of food around because of leaks in the roof and other times having to work out of basically unheated space in the middle of the winter. 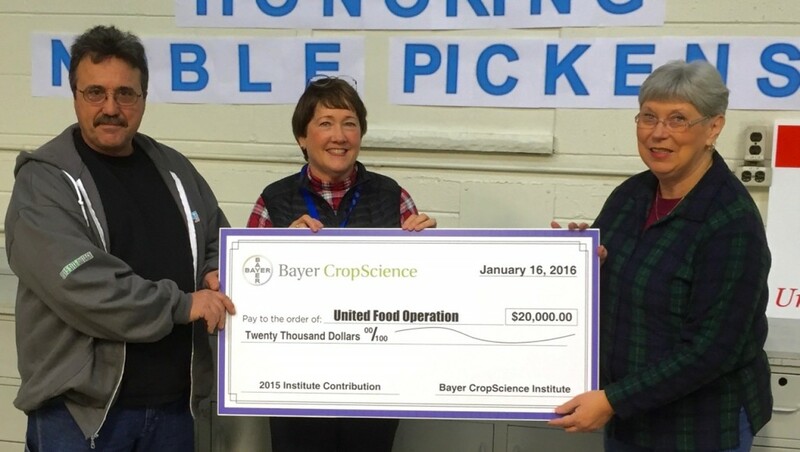 Connie Stewart, center, and Cliff Means present a check for $20,000 from Bayer CropScience to support United Food Operation programs. Receiving the check is UFO Chairperson Elaine Harris. For most of the past decade Bayer CropScience had provided the group use of a good building for food distribution that was located about 150 yards west of the current building. But with Bayer selling much of its Institute Industrial Park space to Dow Chemical last year, the former building’s lot was targeted for other uses and the building scheduled for demolition. Andy Altman, center, explains Dow Chemical Company’s support for United Food Operation by providing the building, including all maintenance and utilities. Left to right are Joe Davenport, a contract employee at Dow and UFO board member; Altman; and UFO Chairperson Elaine Harris. Knowing that would force UFO to find other facilities, the two companies set about solving the problem. During the transition period, Dow and Bayer got together and identified another building at the very northeast corner of the industrial park that would be good for UFO’s use, but it needed a lot of clean-up and renovation. Dow agreed to lease the building to UFO at a most favorable $1/year, and Bayer agreed to take the lead on renovating the building to prepare it for UFO’s use. Working together, the two firms did a great job on a relatively short timeline. 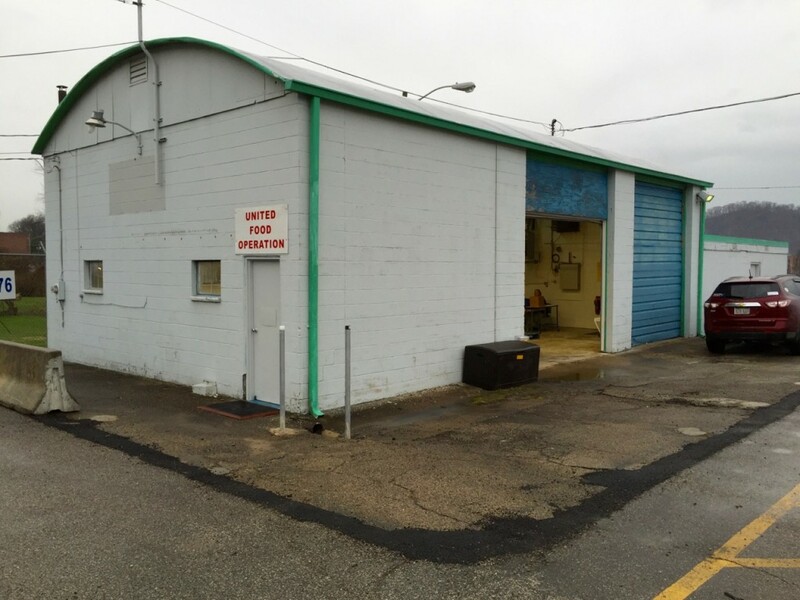 United Food Operation was able to take possession of the building before the end of 2015. The new United Food Operation headquarters and food distribution center at the Institute Industrial Park. Leaders say it’s the best space the group has ever had. The building turned out to be the best space UFO has ever had. It has its own private access off Rt. 25 and a totally fenced lot. Inside, the building has warehouse space, a conference/break room, an office, and a bathroom—all kept toasty warm with a good heating system, The cleaned-up, repaired, and freshly painted facility is now the pride and joy of the group. Dunbar Mayor Terry Greenlee (center) expresses his support for the work of United Food Operation to UFO’s Elaine Harris. With Greenlee is Dunbar Councilman Steve Arnott. Mayor Terry Greenlee, from the neighboring city of Dunbar, stopped by and welcomed folks to his part of the county. He expressed his appreciation the work of United Food Operation. He was accompanied by Dunbar Councilman Steve Arnott, who has long been a UFO supporter. The contributions of Frontier Communications are recognized by UFO . At left is Cheryl Black of Frontier’s West Virginia operations with Elaine Harris. 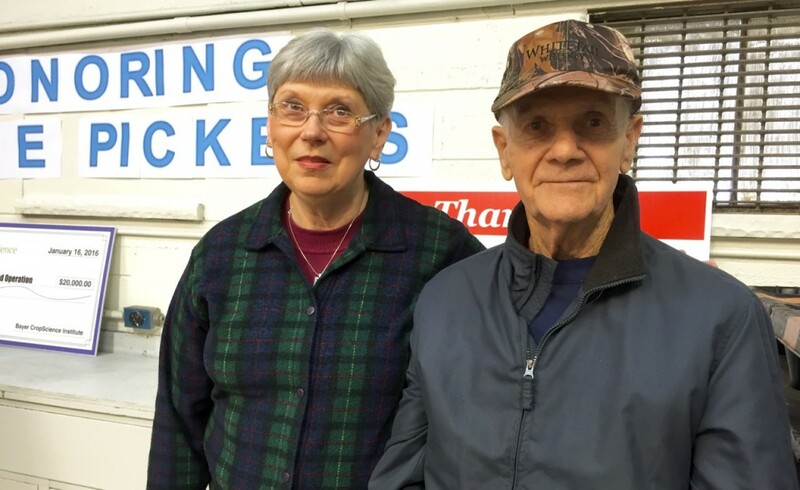 Telecommunications companies have long been core contributors to United Food Operation, providing many thousands of dollars in support through the years. Cheryl Black of Frontier Communications told the group about the company’s efforts this year to raise funds for UFO in cooperation with members of the Communications Workers of America. Contributions from the local unit of Verizon were also acknowledged. Other contributions acknowledged today were those from Clearon’s South Charleston plant, Chemores of Belle, and IVS Hydro of Institute. 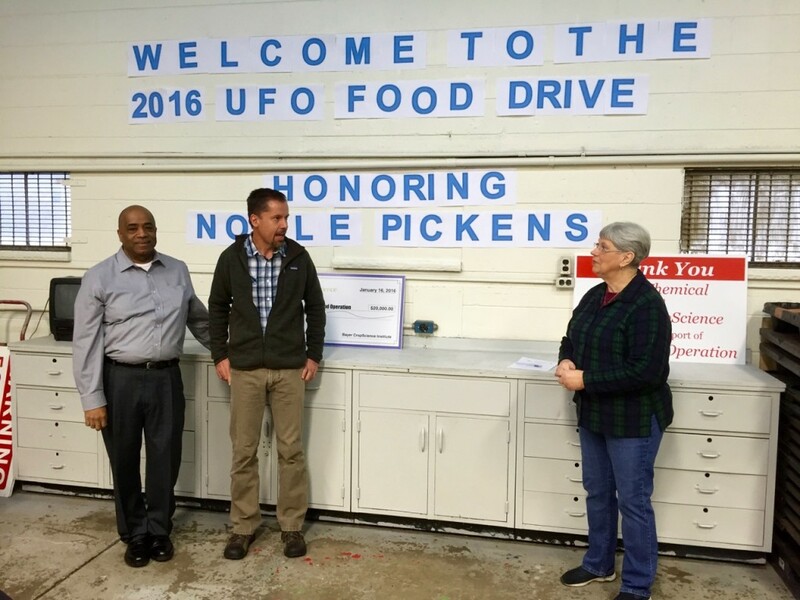 This year’s food drive is dedicated to Noble Pickens. Following his retirement from industry, this Dunbar resident worked tirelessly for UFO, helping run warehouse operations. 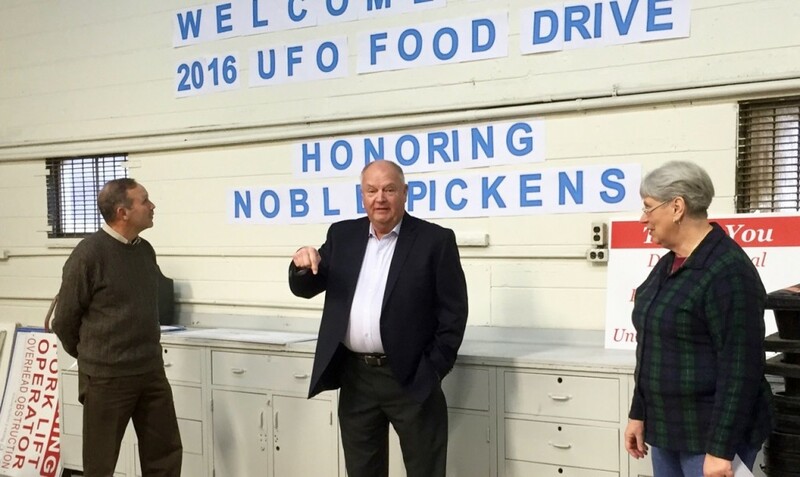 Harris announced that the 2016 food drive was dedicated to Noble Pickens of Dunbar. 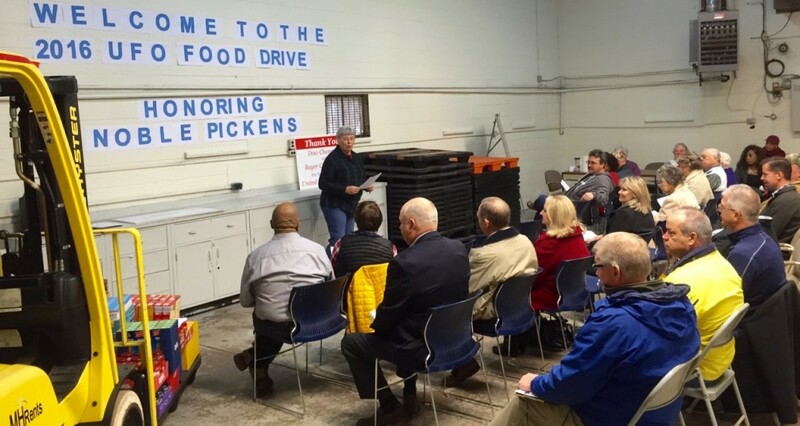 For many years Pickens was a loyal volunteer, who took a lead role in purchasing food and managing distributions to the participating pantries. Recently, his health has greatly limited his volunteer time with the group. 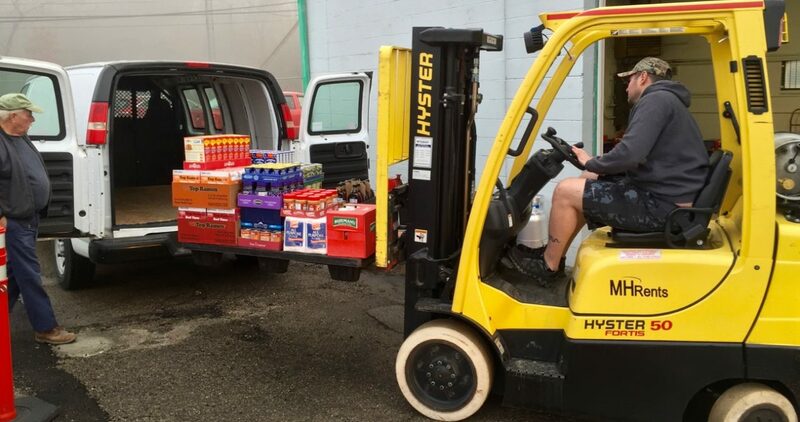 On Friday morning, volunteers provided by the St. Albans Community Food Pantry prepared the pallets of food so they could be distributed to the pantries on Saturday. Volunteers from SGS Petroleum Services, Institute, with the WQBE rabbit. On Saturday morning, before the Open House, the second weekly food distribution of the season was conducted. This week, UFO is indebted to the volunteers who came from SGS Petroleum Services at the Institute Industrial Park. Each week, different organizations takes responsibility for recruiting and supplying volunteers needed to perform food sorting on Fridays and loading the pantry trucks on Saturdays. United Food Operation board members line up for the record. The program has 10 more weeks of food distributions in it’s winter program this year. In May, it will handle food distributions for the Postal Workers Food Drive. All funds donated this winter will go to provide additional food to the weekly food distributions. Wonderful article, people and place.